Parthian's 'Bright Young Things' series continues with its first collection of poetry by young writers in Wales From representations of urban life and drug addiction to critically acclaimed verses from the stage, this book distills diverse and innovative poetry into Ten of the Best, the brightest of what's on offer by young poets in Wales today. 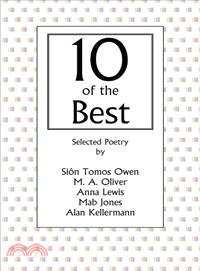 Sion Tomos Owen?is a poet, writer, and illustrator. M. A. Oliver is currently Blown magazine's poet in residence. Anna Lewis is a poet and the recipient of the Foyle Young Poets of the Year Award and the Robin Reeves Prize for Young Writers. She is also the winner of the Christopher Tower Poetry Competition. Mab Jones is a poet, comic, writer, and performer, whose work has appeared in numerous magazines and newspapers, including Border Magazine, Giggle, Square, and Western Mail. She is also a recipient of the John Tripp Spoken Poetry Award. Alan Kellermann is a poetry editor for the Swansea Review. His own work has appeared in Planet, Poetry Ireland Review, and The Seventh Quarry.